Is your hair the boss of you? Are you one to try every style, product and technique shared by your favorite natural hair beauty influencer? Were you often left with less than stellar results compliments of your high porosity hair that has a mind of its own? If your answer is yes, you are not alone. As naturalistas, hell women in general, we've all been this person at one time or another. if you still battle with taming their hair into submission Might I recommend a different ideology about your natural hair care regimen? Whether we like it or not our hair is going to revert back to its true "self" no matter the amount of time or effort we put into manipulating it to bend to our will. I've stopped fighting against my high pororsity hair and instead have learned to love its natural versatility through its life cycle between cleansings. 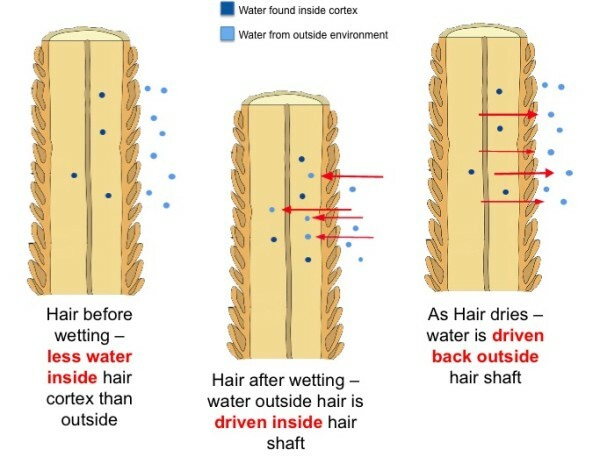 High porosity hair diagram before and after the water-based moisturizing phase. I've come to believe less is more as it relates to my hair styling regimen in the creation of my fulfilled life. I'm all about #simplehealthynaturalhair. This image exemplifies the high porosity hair struggle. Water-based moisturizers are easily absorbed into the high pororsity hair shaft and just as easily escapes if intentional care isn't given to locking in that moisture. As a founder and an advocate of startup culture, I'm busy creating and collaborating. My time is my most valuable commodity and I choose not to waste it forcing my hair into styles my hair will reject immediately or that are far too time consuming to create with a short flawless lifespan. My hair is no longer the boss of me as we've come to a mutual agreement. If I feed my hair the nutrient rich products it needs regularly, avoid over manipulating it and allow it to do what it tends to do naturally, my hair will in turn thrive and look its best for me at all times. In a guest blog post, I share these three tips for high porosity hair that have proven to serve my healthy hair journey well. Try one of these nutrient rich herbal hair butters as your one styling product. Using less product for great hair results is easier than you think. Remember less can be more. What's It Going to Take for You to Startup?